For H.S. 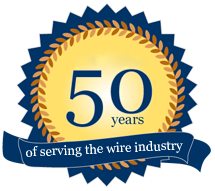 & H.C. steel wires electro & hot deep Galvanising plants ranging from 5mm to 0.4mm sizes with latest pickling system & feum extraction system. We are manufacturer of stress relieving furnaces and cutting machine off straightening wire from India. These are basically designed for stress relieving of P.C. wires, single and stranded wires. We are profound manufacturer and supplier of Pit Pot Type Annealing Furnace which are electrically heated with automatic temperature control and fuel fired using gas or oil. The furnaces are suitable for annealing of ferrous and non ferrous materials. The furnaces use retort assembly either sand sealed or vacuum sealed under inert atmosphere. For MS wires retort assembly is sand sealed (binding wires) or vacuum sealed for scale free annealing of wires to be used for electro galvanizing. It is widely used for annealing of steel coils. The coils can be of steel strips, steel wire or any other shape which can be loaded in the furnace. The furnace can be electrically heated, oil fired or gas fired. It can also be used for de-carburising of Stampings.